The thing which sustains me during my mad dashes to finish books, my writing fuel, coffee. It has been become a staple of my diet and something that starts my day. But it also can be a serious problem when you miss a morning shot of coffee. I’ve incorporated my craziness for coffee into my writing from time to time. With nearly all my characters in the Doorknob Society loving java in one way or another. They also spend their time in my favorite of all the places I’ve created, The Cape Beanery. My series of short stories that all revolved around this establishment, the Cape Beanery Chronicles, is one of my favorites as well. 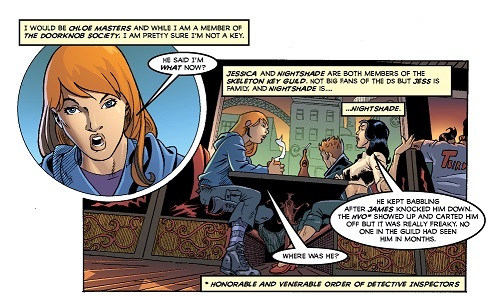 By far the Beanery is one of my favorite places to write about and it has also made its way into the Doorknob Society comic books as well. Chloe, Nightshade and Jess enjoying some coffee at the Cape Beanery. There is nothing better than sitting in a nice coffee shop and sipping a hot cup of joe as I write the latest chapter in The Grimm Chronicles or some other project I am working on. You can rest assured that when I am mainlining coffee I’m working on something that will be making its way to you soon.